How was ur'all Christmas celebrations ? I didn't do much, just a quiet dinner with few close friends,and that was all about Christmas Eve for me ! Also not to forget making of personalized gifts for few kids ! After all for them ,Christmas is only about Santa coming to town,and fulfilling their year's long wishlist ! This was what Santa( tired,hungry and bored ) wore on the Eve,when all I could think was How to please the little tinkers around me !! As for the outfit, it was one of my jeans and shirt days ! The funniest thing I've found is that I can spend hours and hours getting ready to go out, but sometimes the most attractive thing is a gal in a pair of nice jeans and shirt. We just need to get bit crazy and , throw on our favorite jeans, some shoes, and a shirt, and let few accessories make all that difference, after all its time we make our own rules ? What say? Love the necklace and boots. You look so hip. Very nice and I like your jeans and sweater. Have a great day. Your glasses are too cute. Love the spunkiness of this outfit. Hope you had an amazing Christmas! Absolutely!! I just love the comfortable yet smartness about this look!!! in love with your amazing glasses! You look great-- these glasses are adorable on you! Thanks for stopping by and leaving a sweet comment! Would you like to follow each other? We don´t celebrate Santa, we are waiting for 3 kings´gifts. love love love the glass.and that necklace is a pure love. Great look ! and Your bag is just Fab <3 ! LOVELY!! !LOVE THE GLASSES AND THE BAG!!! que guapa estas! me encanta tu blog! Thanks for your comment in the blog, I congratulate you too Merry Christmas! Follow you gfc and bloglovin, so I'm waiting for you at home! hi dear! Thank you for the wonderful wishes and comments on my blog! beautiful outfit! I love your bag! 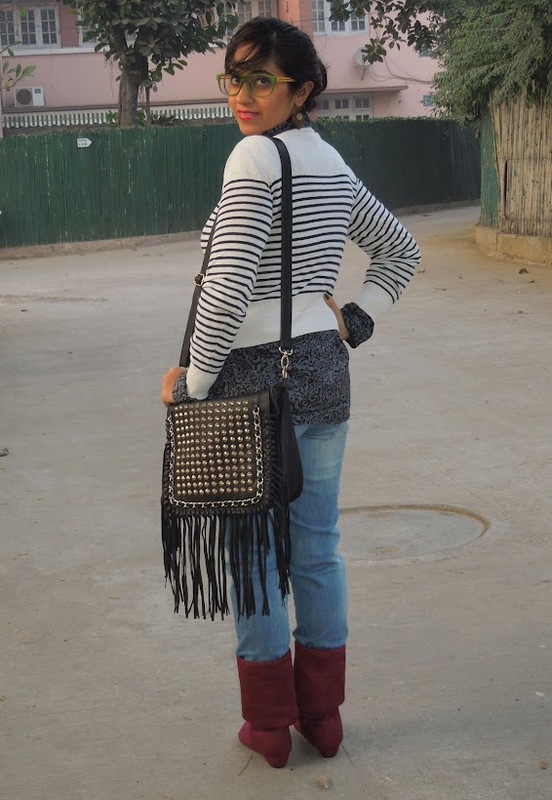 Nice outfit; your red boots give it a Christmas touch.Love your bag!